Eleven brushes: which is best value? If I could only have a single brush for general watercolour painting, I think that it would probably be a size 12 round. With a capacity large enough to handle sky washes in smaller formats, and a fine point which can work the most delicate detail, it must be one of the most versatile brushes available. Paint delivery capacity is particularly important, both when using it for wash work, and for more general and detailed work. There is no point using a larger brush if you have to keep recharging it with paint. However, being a larger size, it can be quite costly: the retail price range of the brushes tested here goes from less than £5 to over £150. 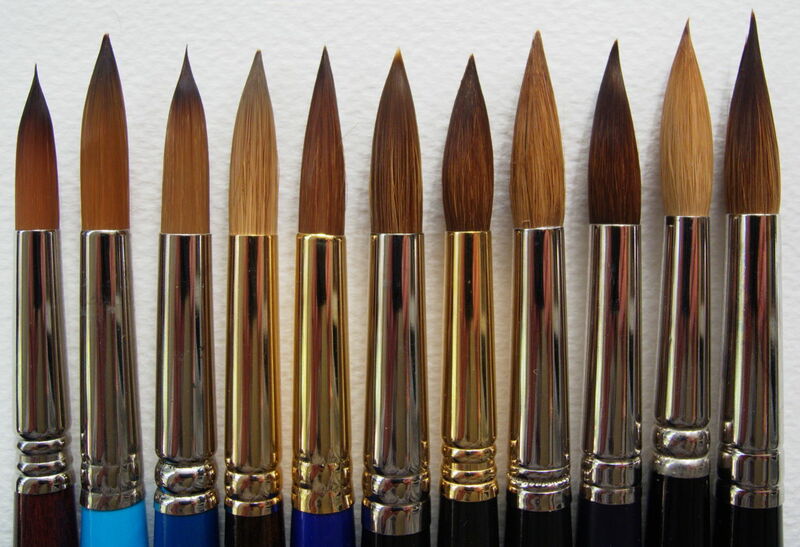 The total retail cost of the eleven brushes came to just under £500: more than many of us can afford to spend on our complete watercolour outfit. I have, as before, included one brush which is nominally a size 10, not 12: the Winsor & Newton Series 7 sable. As you will see, it is comparable in size and performance to the other size 12 brushes, and more expensive than any of the others. Thus of the eleven brushes tested, five are made from sable hair (actually Siberian weasel, a common and widespread species), three from synthetic fibres alone, and three contain a mixture of sable and synthetic. All results are obtained using the test method I have described, and are given as the median (middle) of three tests. Examination of possible error and bias is here. The eleven brushes under test. Fibre is that claimed by the manufacturer; the ferrule diameter (given in mm) was measured at the end of the ferrule, where the hairs emerge from it, using a Hilka Pro-Craft digital micrometer, and is a more accurate measure than the diameter of the belly of the brush, although the latter is usually significantly greater; length (given in mm) is from the end of the ferrule to the tip of the point, using a fine steel rule calibrated to 0.5 mm; cost used was that quoted on Jackson’s website in late July 2015; cover (given in cm²) is the median value of three tests as detailed; cover/cost (given in cm²/£) is calculated as the cover divided by quoted cost. The five pure sable brushes have significantly greater paint delivery capacity, as measured in these tests, than any of the mixed or pure synthetic brushes. However they are also significantly more expensive. If cost is not so important and you want the highest capacity (and all the other benefits of natural sable hair), then you should choose a sable brush. Cover measured in tests against the retail price of each brush. Sables in red, mixed in blue, synthetics in green. The graph above shows capacity against cost, with sables marked in red, mixed fibres in blue, and synthetics in green. The graph below shows the same data, but this time with the cost scale logarithmic, and gives a good indication that cost increases disproportionately with capacity: the more that you pay, the less the increase in capacity. This is the ‘law of diminishing returns’ in action. 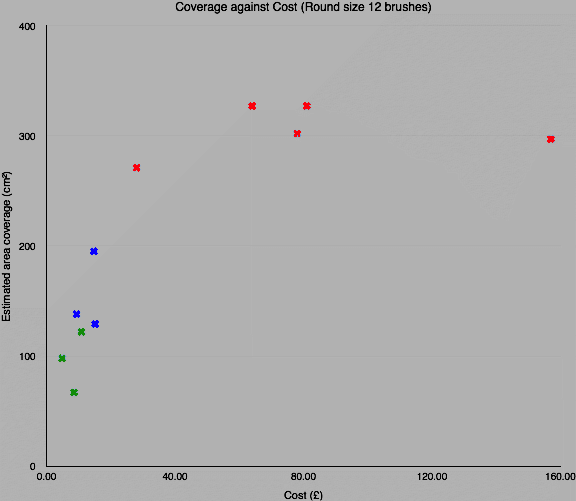 Measured capacity in test against cost, with the cost on a logarithmic scale. Same colour coding. 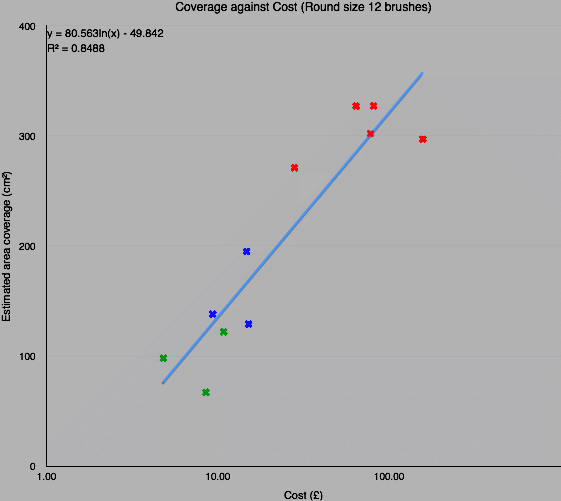 Brushes with higher benefit for their cost are further to the left of the fitted line, at any given height up the graph (capacity). Business ends of the eleven brushes tested, synthetics on the left, sables on the right. Even among sables, there is a wide range of prices, from £28 to £157. The best value, although it also has the lowest capacity of the sables, is the Jackson’s series 1205. Best of the highest performers is the Winsor & Newton Artists’ Water Colour (a brush which I use frequently). Although the mixed sable and synthetic brushes performed consistently better than the all-synthetic models, they did not approach the capacities of the pure sables. The mixed brush which stands out is the Pro Arte Connoisseur 100, but this is a significantly larger brush than the other mixed models and gains in part because of its increased size; in terms of value for money, and allowing for its smaller size, the Jackson’s Icon 700 is also worth looking at. There were surprising differences in capacity between the pure synthetic brushes tested. The Winsor & Newton Cotman 111 approached the capacity of the mixed fibre models, but is also the most expensive of the synthetics (and more expensive than the Jackson’s). Thus if you are looking for a brush around the £10 mark, the Jackson’s Icon 700 and W&N Cotman 111 should be high on your list. There are of course many other important qualities that you seek in a watercolour brush. Capacity is important, and something which (for the moment at least) is not quoted by manufacturers or others, hence my enthusiasm to provide you with my test results. Your capacity will vary, and you should also assess the point of the brush, its spring, and all the other subjective properties which will determine how well it handles in use. I hope that this information is helpful to you in making buying choices, and welcome your feedback. Posted in Painting, Technology and tagged brush, cost-benefit, method, painting, procedure, round, sable, size 12, synthetic, testing, watercolour. Bookmark the permalink.